As some of you may or may not know Jon and I began with our parent company The Metal Gardener in 2007 where Jon does custom gates, lighting, sculpture etc. We were asked at one of our gifting suites to be a sponsor for the City of Hope Bone Marrow Program by director/actor(Minority Report, Criminal Minds, Nip/Tuck, 24) – Patrick Kilpatrick. We decided to donate on of Jon's beautiful sculptures seen here which will go up on the celebrity auction website. 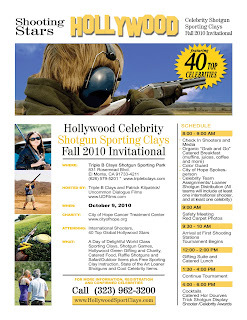 The event was held at Triple B Shotgun Sporting Park in El Monte, California. Celebrities, members of the armed services, and recreational shooters attended teaming up to compete in a day of shooting clays. The mood was festive with a patriotic/harvest theme. The day included team shooting, breakfast buffet, lunch buffet, silent auction, live auction, awards, honors and happy hour. Asian American pop star Chelsea Emata sang the national anthem. Seen here with a bunch of Navy guys. Special guest Joe Mantegna (Criminal Minds, The Godfather: Part III) was there. Ernie Hudson (Ghostbusters,The Secret Life of An American Teenager)sat down with us to have lunch. We'd met him before at several charity events. He's super humble and said he wears our crown buckle often.He was there to hang with his son who was down from school. Erik Estrada (Chips), came over and hung at our table and signed a ton of pics of when he was in his early 20's. He was such a character. His beautiful wife and kids were there as well. I believe he won one of the awards for shooting. Then along came Roger Cross (agent curtis 24). He was too funny, cracking a bunch of jokes and bought a few pieces of art at the silent auction.